You are here: Home>Archive>First World War Collection>WW1 Medals and ribbons awarded to Harold Godwin>World War One Victory medal awarded to 4th Class Artificer Harold Godwin. World War One Victory medal awarded to 4th Class Artificer Harold Godwin. 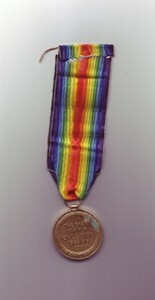 World War One Victory medal awarded to ‘M.16168 H.E. GODWIN E.R.A.4, R.N ‘ (stamped around the edge). 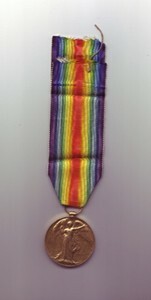 The ribbon has a two rainbow design with violet on the outside edges moving to red in the centre. The bronze medal has a full length winged Victory with her left hand raised and a palm branch in her right on the obverse and the words ‘THE GREAT WAR FOR CIVILISATION 1914-1919’ surrounded by a laurel wreath on the reverse.